The Sopwith Triplane was a British single seat fighter aircraft designed and manufactured by the Sopwith Aviation Company during the First World War. Pilots nicknamed it the Tripehound or simply the Tripe. The Triplane became operational with the Royal Naval Air Service in early 1917 and was immediately successful. The Triplane was nevertheless built in comparatively small numbers and was withdrawn from active service as Sopwith Camels arrived in the latter half of 1917. Surviving aircraft continued to serve as operational trainers until the end of the war. The Triplane began as a private venture by the Sopwith Aviation Company. The fuselage and empennage closely mirrored those of the earlier Pup, but chief engineer Herbert Smith gave the new aircraft three narrow-chord wings to provide the pilot with an improved field of view. Ailerons were fitted to all three wings. By using the variable incidence tailplane, the aircraft could be trimmed to fly hands-off. The introduction of a smaller 8 ft span tailplane in February 1917 improved elevator response. The Triplane was initially powered by the 110 hp Clerget 9Z nine-cylinder rotary engine, but most production examples were fitted with the 130 hp Clerget 9B rotary. At least one Triplane was tested with a 110 hp Le Rhône rotary engine, but this did not provide a significant improvement in performance. The prototype Triplane, serial N500, first flew on 28 May 1916, with Sopwith test pilot Harry Hawker at the controls. Within three minutes of takeoff, Hawker startled onlookers by looping the aircraft three times in succession. The Triplane was very agile, with effective, well-harmonised controls. When maneuvering, however, the Triplane presented an unusual appearance. One observer noted that the aircraft looked like "a drunken flight of steps" when rolling. In July 1916, N500 was sent to Dunkirk for evaluation with "A" Naval Squadron, 1 Naval Wing. It proved highly successful. The second prototype, serial N504, was fitted with a 130 hp Clerget 9B. N504 first flew in August 1916 and was eventually sent to France in December. This aircraft served as a conversion trainer for several squadrons. Between July 1916 and January 1917, the Admiralty issued two contracts to Sopwith for a total of 95 Triplanes, two contracts to Clayton & Shuttleworth Ltd. for a total of 46 aircraft, and one contract to Oakley & Co. Ltd. for 25 aircraft. Seeking modern aircraft for the Royal Flying Corps, the War Office also issued a contract to Clayton & Shuttleworth for 106 Triplanes. In February 1917, the War Office agreed to exchange its Triplane orders for the Admiralty's SPAD S.VII contracts. Production commenced in late 1916. Sopwith and Clayton & Shuttleworth completed their RNAS production orders, but Oakley, which had no prior experience building aircraft, delivered only three Triplanes before its contract was cancelled in October 1917. For unknown reasons, the RFC Triplane contract issued to Clayton & Shuttleworth was simply cancelled rather than being transferred to the RNAS. Total production amounted to 147 aircraft. No. 1 Naval Squadron became fully operational with the Triplane by December 1916, but the squadron did not see any significant action until February 1917, when it relocated from Furnes to Chipilly. No. 8 Naval Squadron received its Triplanes in February 1917. Nos. 9 and 10 Naval Squadrons equipped with the type between April and May 1917. The only other major operator of the Triplane was a French naval squadron based at Dunkirk, which received 17 aircraft. The Triplane's combat debut was highly successful. The new fighter's exceptional rate of climb and high service ceiling gave it a marked advantage over the Albatros D.III, though the Triplane was slower in a dive. The Germans were so impressed by the performance of the Triplane that it spawned a brief triplane craze among German aircraft manufacturers. Their efforts resulted in no fewer than 34 different prototypes, including the Fokker V.4, prototype of the successful Fokker Dr.I. The Triplane was famously flown by No. 10 Naval Squadron's "B" Flight, better known as "Black Flight." This all-Canadian flight was commanded by the ace Raymond Collishaw. Their aircraft, named Black Maria, Black Prince, Black George, Black Death and Black Sheep, were distinguishable by their black-painted fins and cowlings. Black Flight claimed 87 German aircraft in three months while equipped with the Triplane. Collishaw himself scored 34 of his eventual 60 victories in the aircraft, making him the top Triplane ace. For a variety of reasons, the Triplane's combat career was comparatively brief. In service, the Triplane proved difficult to repair. The fuel and oil tanks were inaccessible without substantial disassembly of the wings and fuselage. Even relatively minor repairs had to be made at rear echelon repair depots. Moreover, spare parts became difficult to obtain during the summer of 1917, and No. 1 Naval Squadron's complement was reduced from 18 to 15 aircraft. The Triplane also gained a reputation for structural weakness because the wings sometimes collapsed in steep dives. This defect was attributed to the use of light gauge bracing wires in the 46 aircraft built by subcontractor Clayton & Shuttleworth. Several pilots of No. 10 Naval Squadron used cables or additional wires to strengthen their Triplanes. In 1918, the RAF issued a technical order for the installation of a spanwise compression strut between the inboard cabane struts of surviving Triplanes. One aircraft, serial N5912, was fitted with additional mid-bay flying wires on the upper wing while used as a trainer. Another drawback of the Triplane was its light armament. While contemporary Albatros fighters were armed with two guns, most Triplanes were armed with a single synchronised Vickers machine gun. Efforts to fit twin guns to the Triplane met with mixed results. Clayton & Shuttleworth built six experimental Triplanes with twin guns. Some of these aircraft saw combat service with Nos. 1 and 10 Naval Squadrons in July 1917, but performance was reduced and the single gun remained standard. Triplanes built by Oakley would have featured twin guns, an engineering change which severely delayed production. In June 1917, No. 4 Naval Squadron received the first Sopwith Camels and the advantages of the sturdier, better-armed fighter quickly became evident. Nos. 8 and 9 Naval Squadrons transitioned to the Camel between early July and early August 1917. No. 10 Naval Squadron converted in late August, turning over its remaining Triplanes to No. 1 Naval Squadron. No. 1 operated Triplanes until December, suffering heavy casualties as a consequence. By the end of 1917, surviving Triplanes were used as advanced trainers with No. 12 Naval Squadron. Serial N5912 on display in the Grahame White Hangar, at the Royal Air Force Museum London. Only two authentic Sopwith Triplanes remain in existence. N5912 was one of three aircraft built by Oakley & Co. Ltd. and delivered in late 1917. The aircraft saw no combat service and instead served with No.2 School of Aerial Fighting and Gunnery at Marske. After the war, the Imperial War Museum displayed the aircraft in a temporary exhibition until 1924. In 1936, the Royal Air Force acquired and restored the aircraft, flying it in several RAF Pageants at Hendon. Today, N5912 is preserved at the RAF Museum London. N5486 was supplied to the Russian Government for evaluation in May 1917. In Russia, the aircraft was fitted with skis and used operationally until captured by the Bolshevists. The aircraft then served in the Red Air Force, probably as a trainer, and was rebuilt many times. Today, N5486 is preserved at the Central Air Force Museum, Monino, Russia. The popularity of the Triplane has resulted in numerous modern reproductions, built by both museums and individual enthusiasts. Northern Aeroplane Workshops built a notable reproduction for the Shuttleworth Collection. The aircraft is marked as Dixie II, representing the original Dixie, serial N6290, of No. 8 Naval Squadron. In recognition of the reproduction's remarkable authenticity, Sir Thomas Sopwith decreed it to be a “late production” Triplane. The Sopwith Aviation Company (based at Brooklands) was created in June 1912 by Thomas Octave Murdoch (Tommy, later Sir Thomas) Sopwith, a well-to-do gentleman sportsman interested in aviation, yachting and motor-racing, when Sopwith was only 24 years old. Following their first military aircraft sale in November 1912, they moved to the company's first factory premises opened that December in a recently closed roller skating rink in Canbury Park Road near Kingston Railway Station in South West London. An early collaboration with the S. E. Saunders boatyard of East Cowes on the Isle of Wight, in 1913, produced the Sopwith "Bat Boat", an early flying boat with a Consuta laminated hull which could operate on sea or land. A small factory subsequently opened in Woolston, Hampshire in 1914. Towards the end of the war, Sopwith took out a lease on National Aircraft Factory No.2, constructed in 26 weeks during the winter of 1917 a mile to the north of the Canbury works in Ham. The company were able to greatly increase production of Snipe, Dolphin and Salamander fighter planes as a result. After the war, the company attempted to produce aircraft for the civil market based on their wartime types, such as the Dove derivative of the Pup and the Swallow, a single-winged Camel, but the wide availability of war-surplus aircraft at knock-down prices meant this was never economic. In 1919 the company worked with ABC motorcycles and produced 400cc flat twin motorcycles under licence. They also purchased ABC Motors in an attempt to diversify, but this venture also failed. The Sopwith company was wound up in 1920 after the business collapsed, and in the face of a potential large demand from the government for Excess War Profits Duty. The remaining lease on the Ham factory was sold to Leyland Motors. 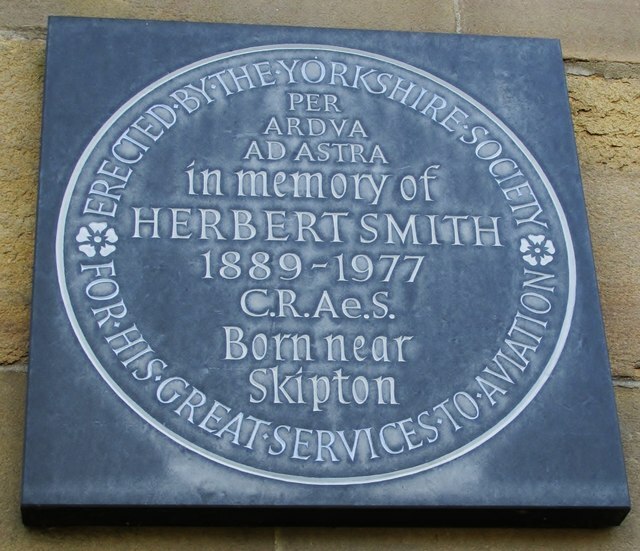 Smith started his career with the Yorkshire engineering company of Dean, Smith & Grace. He joined the Sopwith Aviation Company as a draughtsman in March 1914 and became Sopwith's chief engineer later that year. Smith designed the Pup, Triplane, Camel, and Snipe. In 1916, Herbert Smith became Chief Engineer of the Sopwith company, and under his design leadership its other successful World War I types included the larger Type 9901 and the Pup. Experimentally equipped with three narrow-chord wings and a more powerful engine, the Pup led to the Triplane, which was used by just four squadrons of the RNAS during 1917, but became well known for its startling fighting qualities, put to best use by Raymond Collishaw's famous 'Black Flight' of 'Naval 10' (No. 10 Squadron RNAS). This flight was so called due to the black identification colour of the flight's aircraft, which in turn led to their naming as Black Maria, Black Prince, Black Death, Black Roger and Black Sheep. Such was the impact of this type that it spawned a large number of experimental triplane designs from manufacturers on all sides, although only the Fokker Triplane achieved any subsequent success. In the early summer of 1917 the twin-gun Camel fighter was introduced and this replaced the Triplane. Smith worked for the Sopwith firm until it dissolved in October 1920. In February 1921, the Mitsubishi Internal Combustion Engine Manufacturing Company in Nagoya invited Smith, along with several other former Sopwith engineers, to assist Mitsubishi in creating an aircraft manufacturing division. Smith and his team moved to Japan, where they designed the B1M, 1MF, and 2MR. Smith returned to England in 1924 and retired from the aviation industry.